Gary is the master-mind, dreamer and philosopher of Blue Heron Vineyards. His vision is the reason for all that we are as a business. He often says he wears too many hats (and proved it one day by walking in the living room wearing about 20!). He is the vineyard master, the cellar master, the stick carver and main caretaker of the property. His background is in Education. He graduated from the University of Tennessee- Chattanooga, where he had a four-year basketball scholarship as well as Masters Degrees from IU and Indiana State. He taught at Lookout Mountain Jr. High, TN, Troy, IN, Hoosier Heights Jr. High and Tell City High School until he ended up in prison…where he taught (got you there for a minute, didn’t I?). Before he retired in 2007, he was the Education Administrator at Branchville Correctional Center. Lynn is an artist as well as co-owner of Blue Heron Vineyards. Her artistic eye and talents are put to good use at the Winery. Lynn is active in all parts of the business from harvesting grapes to planning the summer concert series, Wine Over Water. Lynn retired from teaching Art in Tell City and Perry Central Community Schools after 33 years. 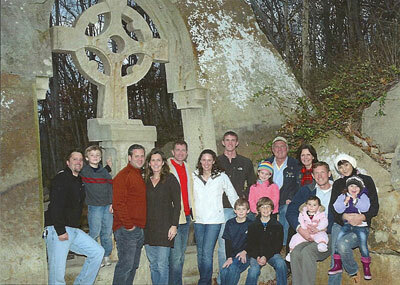 Her academic background includes a BA from Kentucky Wesleyan College and MA from Western Kentucky University. Gary and Lynn have five children: Karma, a photographer, lives in Fairhope, AL with her husband and two beautiful children. Lance, in sales, lives with his two handsome sons in Taylors, SC. In addition, he is a published author and women’s self-defense instructor. Cassidy, an ‘04 West Point grad, is married with two adorable girls. He is an Army Major currently serving in Germany and taught German at West Point in ‘13-'14. Adrian is a graduate of THE Ohio State University as is her husband Justin (he, a Major...MA from Yale.. and she, a Captain). She processed out of the Army to start grad school and a family. They are now the proud parents of two awesome children. Boyce, an Aeronautical Engineering graduate of Purdue, is youngest Major (Air Force) in the family. He holds a Masters Degree from AFIT, is stationed at LA Air Force Base, CA and currently deployed to Afghanistan. He and his wife have one young son. 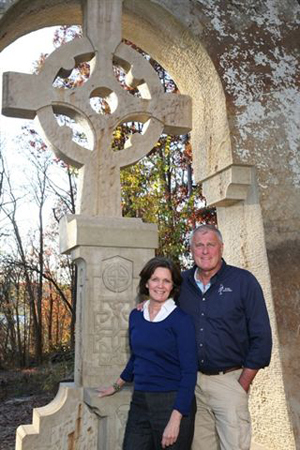 Gary and Lynn in front of the Celtic Cross at Blue Heron Winery.